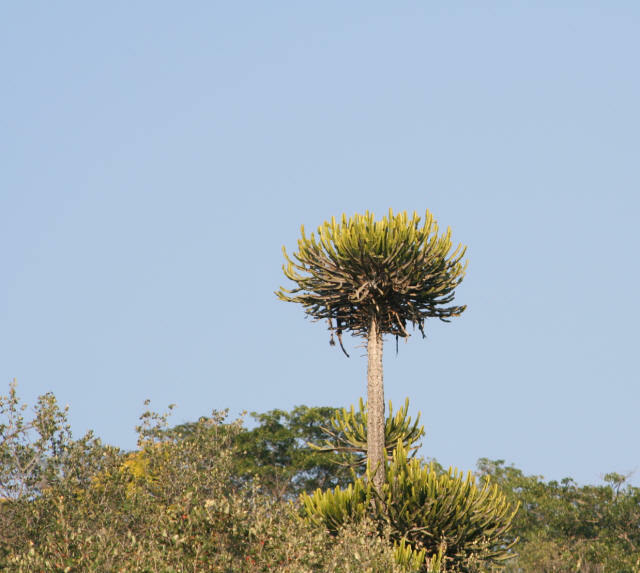 Description of the some of the highlights of the 30 km drive around the 600 metre hills surrounding Punda Maria camp in May 2006. 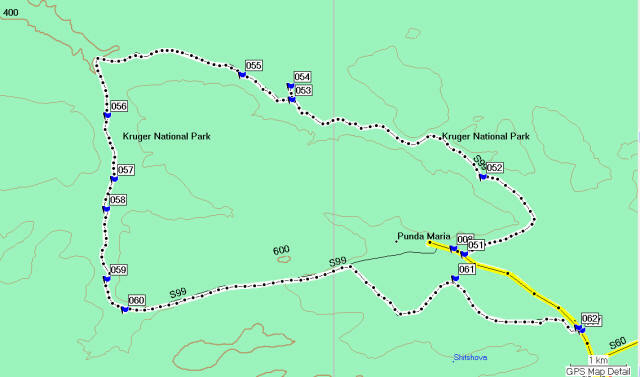 Many images on this Kruger Park GPS (global positioning system) and map-based site will be in thumbnail view so click these to see the enlarged image. Close to the Punda Maria camp in fact slightly north is where Potgieter and Bronkhorst is where these stalwarts of the Afrikaner nation Great Trek passed by in 1836 with their small group. 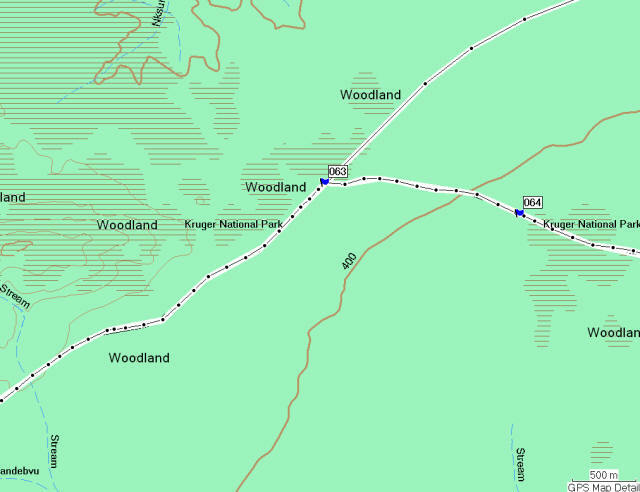 A chapter describing this trek is worth reading here: description of part of the Great Trek. . Bronkhorst was the person who recorded the details of the trek with Potgieter. This drive is a splendid and scenic one ... well worth doing. This is a map of the Mahonie drive close to the Punda Maria camp. In fact it is a drive that goes around the hills surrounding Punda Maria. It takes you through some beautiful wooded and hilly country scenically stunning in the autumn morning light. Waypoint 051 ... this is where the loop started for me since I decided to to travel in an anti-clockwise direction. 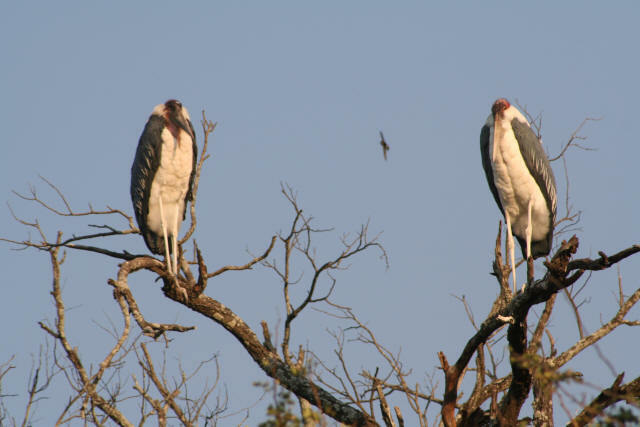 This was prompted by my sighting of Marabou Storks sitting in a tree. These birds are scavengers and are often seen in very large groups. Marabou Stork seem to have white legs when in fact they do not. The white is the result of the bird defecating and urinating down its legs to create a sealant against insect bites. The drive was along the side of a fairly steep hillside on my left. As I approached waypoint 052 I found myself between 2 hills and had wonderful close up views of a wide variety of trees and shrubs growing on the hillsides. The image shows a White Syringa tree of which there are many in this region. I passed a family of Kudu and a very large lone male Buffalo standing motionless (but stirring directly at me) very close to the road. It was possible to really study the Buffalo and the size and power within its massive shoulders was something that really stood out. Take a look at the Buffalo's face, note the tattered ears and perhaps a sign of weariness. Waypoint 053 and 054 ... The Witsand borehole in a large clearing. It had been reported in the camp sighting book that lions had been seen at this point on the previous day. Waypoint 055 ... I just had to take a photo of this wonderful plant ... a "Deadliest Candelabra Euphorbia" so called because its latex is extremely poisonous. It does look like a Candelabra, doesn't it? The Kruger is not well blessed with water especially in these northern regions. So when you come across a beautiful small flowing stream as I did at 056 I just had to stop and take a good look. This had to be an area inviting all sorts of wildlife. 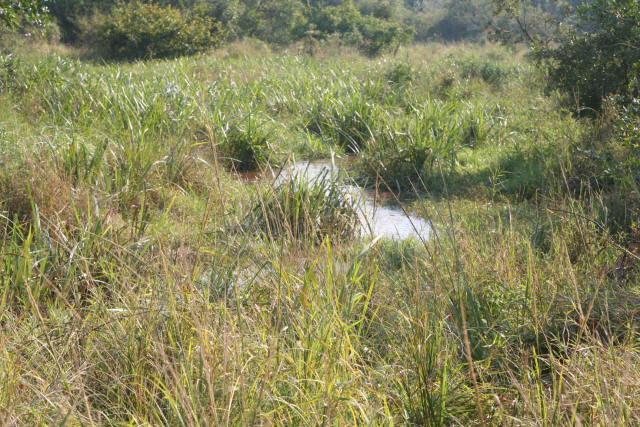 The stream is called the Matukwale and is North West of Punda Maria. It does not always flow strongly but is reported to flow for a long time after good rains. The stream splits into 2 just west of this waypoint. 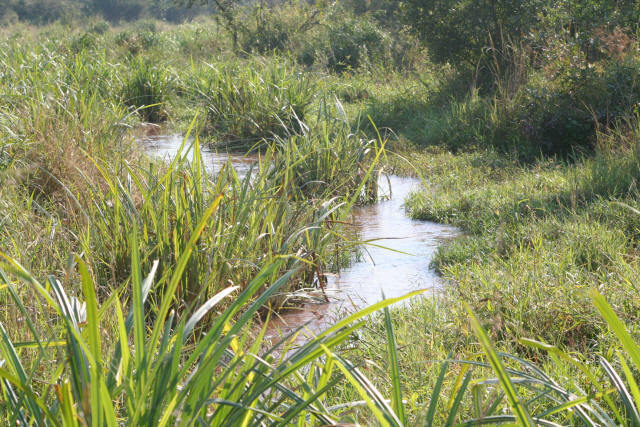 There is a second stream with the name Matukwale which is South West of Punda Maria. I read that this stream had an earthen dam on it and one day sometime between 1954 and 1958 while fishing from this dam wall a crocodile took the dog belonging to ranger Gus Adendorff. This prompts me to tell the story of another ranger and a crocodile incident. There is a golden rule in the Kruger ... always assume that a water spot holds a crocodile. This ranger story revolves around the fact that in this particular dam it was well known that there was a big crocodile. On a hot day the ranger was passing with friends and they could see the crocodile on the far bank so it was decided to take a swim while watching for the crocodile's possible entry into the water. Shortly after entering the water and with no movement from the crocodile on the far bank the ranger was attacked by another crocodile and it bit off an arm before he was rescued by his friends. The assumption that there was only a single crocodile in the dam was wrong. Crocodiles travel over dry land to reach new water spots. Waypoints 57 to 059 are on a particularly beautiful stretch of the drive. 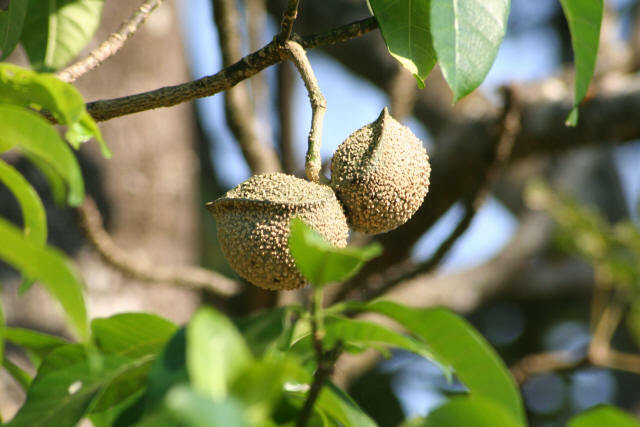 At 059 I too a photo of an unusual fruit that I have not identified. The tree had wonderfully glossy leaves. Waypoint 060 ... 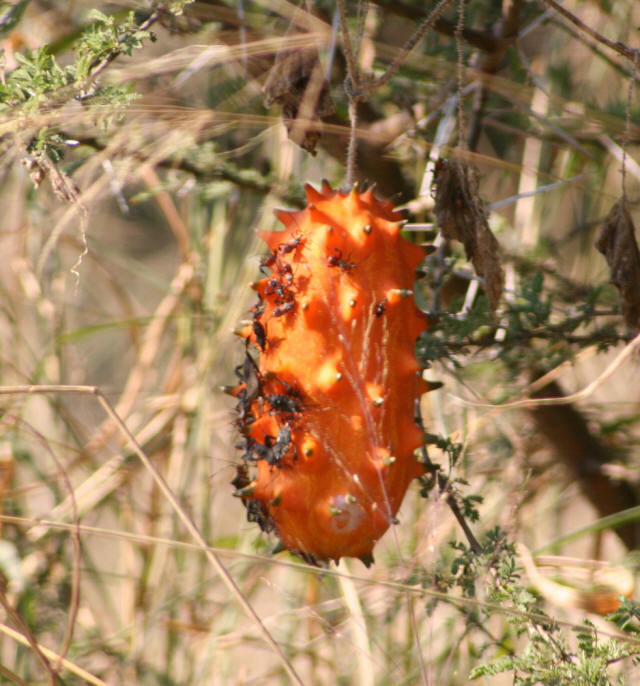 This bright orange spiky cylindrical fruit was being feasted upon by a range of insects including ants. Like the fruit above I do not know its name r the name of the tree. 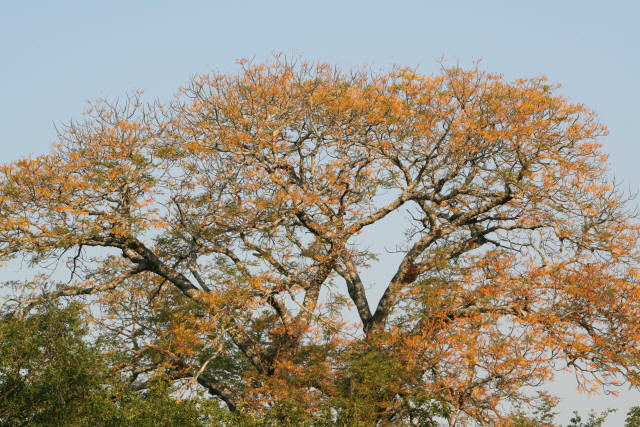 This was just another small piece in a massive Kruger Park jigsaw puzzle. Waypoint 061 ... This is the location of the J J Coetzer borehole named after J J Coetzer who was a Park ranger stationed at Punda Maria between 1919 to 1923. The Matukwale stream flows close by. Waypoint 062 marks the end of the loop. From this point I drove north to complete the S59 drive I had been prevented from doing by the charging elephants. From thereon I headed towards Shingwedzi the next camp south of Punda Maria. It was startling to see a vastly different countryside around waypoint 063 and 064. I had left behind the woodlands of Punda Maria to meet the vast Mopane plains. The map shows this very well.